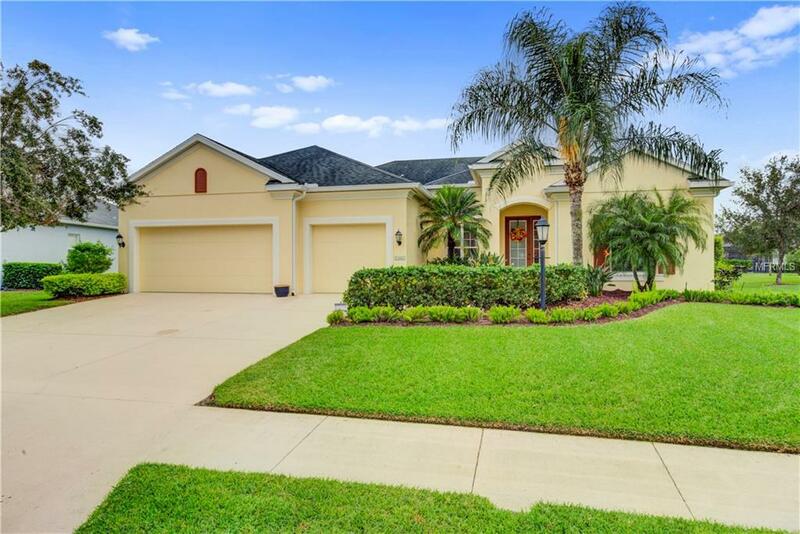 Imagine yourself immersed in luxury in this open floor plan that includes 4 large bedrooms AND A DEN. Exquisite interior features, custom high ceilings, and large rooms. The master suite is your private retreat providing both comfort and space for a sitting area complete with large walk in closets. You deserve to relax in an opulent master bath with his and hers sinks, a spa tub and separate shower.The formal living and dining area are a great space to entertain and enjoy the views of the lake. The spacious eat in kitchen features a breakfast bar and great views to the saltwater pool. Snuggle up in the family room for a good movie after dinner. The guest quarters are in the back of the home and feature a nice bedroom complete with a separate full bath. There is also a large laundry area with storage. Rivers Reach has a full scale community amenity center that features a fitness area, community pool, spa, Kayak Launch, Clubhouse, walking trails, sand volleyball, and a playground. This home and community have it all. The owners have paid off the CDD bond which gives the buyer an advantage over every other home listed in this community. Listing provided courtesy of Julia Int'l Real Estate Llc.